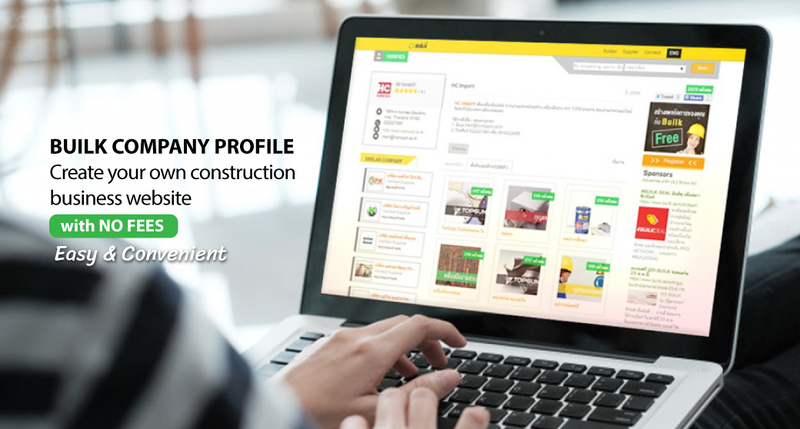 BUILK Company Profile helps the contractor businesses gaining more trustworthy perspective through an online channel; this feature also helps boost up the sales opportunity and eventually getting more works. You are able to choose the website display to show your previous works and services, it could be done within seconds; with our help, of instant template provided on the BUILK Company Profile – this feature not only helps you gain more awareness among your target but also helps you save the cost. Your customers can go through your works via this BUILK Company Profile and contact you directly via contact number or email immediately. Starter business or just began to create their page and not yet participate in any BUILK activities. and business who had participated BUILK activities – then received the verified badge. PRO NETWORK – business(es) that has the guaranteed great standard working flow, and as good as BUILK can grant & recommend this business. Since this business has utilized the complete flow of BUILK Cost Control features (created more than 100 POs and continually use BUILK as their routine) However, if the business stops using BUILK, their PRO NETWORK badge will be remove out. Develop your reputation by getting vote(s) from BUILK users, and those votes will be shown from 1-5 (the shown numbers is the average rates from all votes) Once you got the vote(s), you will be notified via your registered email. We understand that construction business isn’t going by as other business do. So we implemented the completed forms that has all infos you will need to tell your customers to contact back. (it helps to avoid the lack of contact channels given out). These form can be mainly separated into 3 forms: company infos, past works portfolio, and products and/or services infos. Company info form, this form includes contact person infos, specialize in what construction area and company summarize infos. In addition, for more specific area you want to provide for your customers, you can also provide the more detailed about what type of works you offer for them. past works portfolio form – info that can add to such as project type, project duration, and project value. URL for your website will be “www.builk.com/(yourcompanyname)” The URL name can be included both alphabet and number. BUILK Company Profile supports all electronic devices for the best online website experience (responsive), including PC, Laptop & Smartphone. You also able to set the work area for each member(s) such as able to add up the product or service, but not able to fix any company infos. SEO is one of the technique that can help your page to getting to the top search in GOOGLE. Company Profile that has a fully information provided and fill up enough workpieces uploaded will be getting BUILK recommendation to the project owner whose looking for the contractor or will be chosen to get the online PR. BUILK helps every relation between each construction business together with our online & offline events. – please note: due to the big data of users we have, we do need to filter the best users to participate in our event.